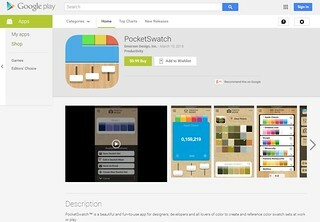 I’m excited to announce that the 2.0 update to my color swatch app “PocketSwatch” is finally finished and released! Apple 64bit Requirement: First of all – the main reason I decided to update the app in the first place was because PocketSwatch would have been taken off the App Store if I didn’t update it to meet Apple’s new 64-bit requirements before June or July this year … so I was forced to let that happen or at the very least republish it w/the updated 64-bit stuff. Photo Mode! : While I was dusting things off I got the idea to re-research the notion of adding a “Photo” mode to the app that allowed users to pull colors from the camera or photos since I wasn’t able to do it for the initial release. After a helpful boost in the right direction from a helpful article written by my pal Raymond Camden* I was able to get this functionality built out and working. So … as seen in the banner graphic above there is now a full-fledged “Photo” mode to the app that let’s users select photos or take new photos w/the camera and create color swatch sets from them! So if you’ve ever wanted to know what the RGB color value of a yellow Skittle is … now you can find out! The functionality isn’t perfect yet by any means but it definitely does the job and I think it’s a fine starting point at a minimum. UI Update: Naturally I couldn’t resist cleaning up the look and feel of things to keep up with the times so the app icon and overall look of the app both got a mini face lift. Other Misc Stuff: There are a handful of other updates (additional background textures, bit better Pantone® color handling and a few other things. One last thing … the other idea I had while working on updating the app was to attempt to take another stab at getting PocketSwatch compiled and working on Android devices. I tried this during the previous/initial version of the app but I had very little experience with Android dev at that point, plus the framework I use (PhoneGap) was a bit more rough around the edges then. 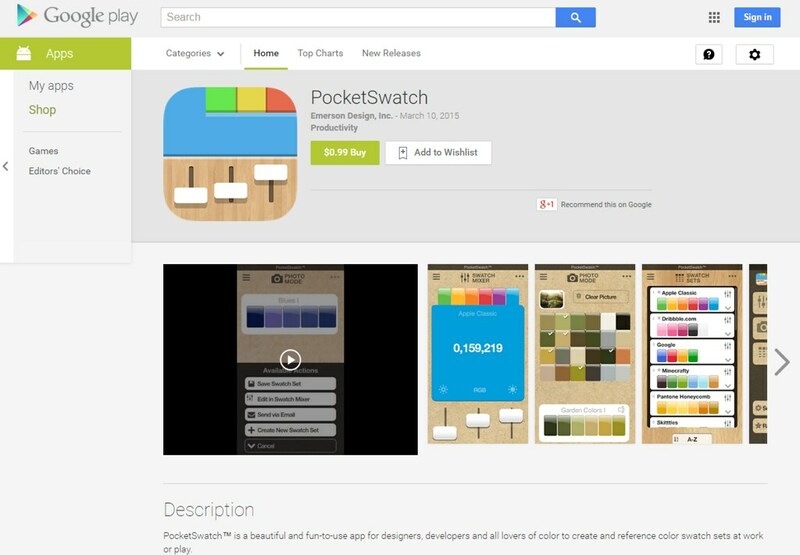 Anyhow – thanks to having a bit of a better starting point on both of those fronts this time I was able to do it … so PocketSwatch is now available on the Google Play app store as well! On a related note – since the Google device situation is so insane (i.e. way too many types of phones and even worse variety of operating system versions across devices) I wasn’t able to go overboard testing Android much. I think most modern phones will do fine w/it but older ones with older operating system versions may/may not perform great. If anyone actually downloads it on an Android device and reports trouble I will look into it of course … as time permits yadda yadda. Oh yeah – here’s the preview video of the new version in action! PocketSwatch 2 from Chris Emerson on Vimeo. You know I think I have some weird obsession with the moon. If you go to the main page of my blog right now 4 of the pictures there have a giant, full moon in them. Weird. Anyhow … a few weeks ago I got the urge to paint a window scene of some kind. Here’s the final result after kicking it around for a few minutes every couple days. The most fun I had with this was doing the curtains and the wallpaper. Neither of them are amazing or anything but something about making them was fun and a bit outside my usual techniques. The thing I feel most bad about is the small picture frame to the right center. I wish I could have found a way to shine more light over there because that little picture was fun … but since it’s so dark over there you really can’t see/appreciate it. I also I really wanted to introduce some kind of animal or character in there but I think it would have been too crowded so I resisted … maybe next time. As usual I used Procreate on the iPad to make this.